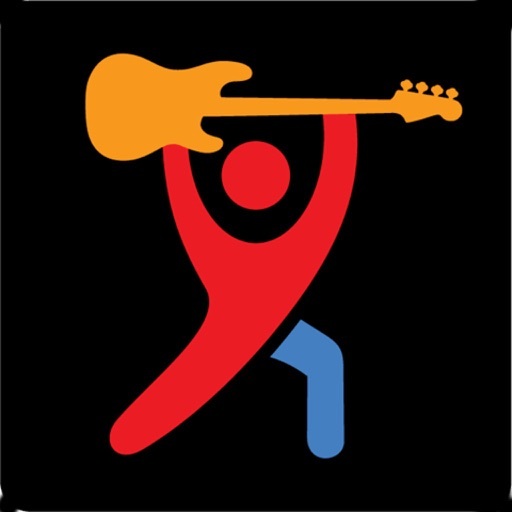 Based on the best selling book "Bass Fitness" published by Hal Leonard in 1991, Bass Fitness rapidly became and has remained the gold standard of bass warm-up exercises. 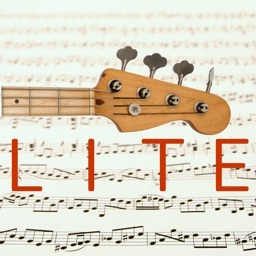 Endorsements from legendary music schools and world-renowned bass players soon followed. These exercises for bass guitar are designed to help increase your speed, improve your dexterity, develop accuracy and promote finger independence. Even though all the tablature and finger combinations apply to the left hand, they will also work your right hand as some of them require swift and precise right hand moves. Practice daily, playing each exercise for at least 15 minutes before moving on to the next one. 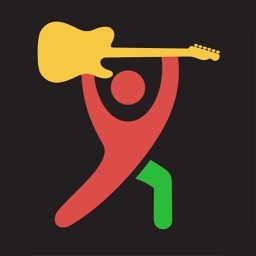 Play each exercise up and down, then move up chromatically in half steps (a half step equals one fret). Starting at fret 1 up to the 12th fret and back down. Always use a metronome, playing 8th notes (2 notes per metronome click). Start at the slowest indicated speed, concentrate on your sound, then gradually speed up. When crossing over strings be as precise as possible by watching alternatively your left and right hand. Each exercise is presented with a Transport panel below it. The buttons on the Transport panel function, in the initial position, allow the user to listen to the exercise being played. The user may record themself playing the exercise. The right position on the toggle button indicates the presence of a user recording. A red color on the wave form icon indicates that a recording has been completed, and the user can play back their recording. The loop button is used to repeat playing the exercise. 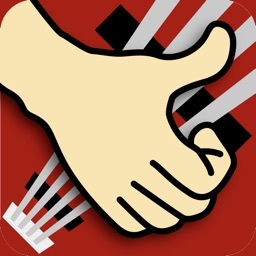 The metronome button is used to play a click in addition to the exercise. 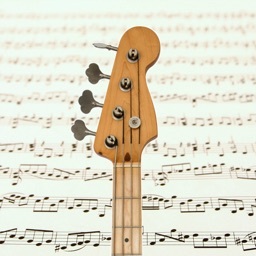 This exercise can be display in bass guitar Tablature notation and bass clef Standard music notation. The Table Of Contents allows ease of movement in the book. Also built into the Table Of Contents is the ability to keep track of which exercises you have completed: Exercises that you have listened to (played) will be marked with a blue square. Exercises that you have recorded yourself practicing the exercise will be marked with a red square. The tempo slider area is used to control the beats per measure (BPM) of the playback. The user can use the slider to increase or decrease the tempo. The mixer button pops up a volume control panel for adjusting the relative volume of the bass guitar and the metronome. 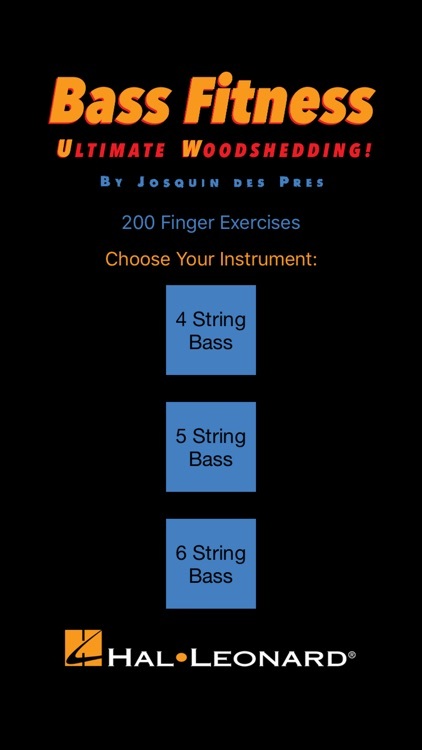 Josquin Des Pres has written some of the best-selling instruction books in the history of the electric bass. Introduced over 25 years ago, Bass Fitness rapidly became the gold standard of bass warm-up exercises. 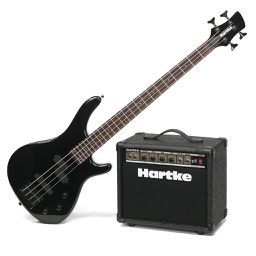 Endorsements from legendary music schools and world-renowned bass players soon followed. Josquin's music career spans over four decades of collaboration with some of the biggest names in the field. A world-renowned bass player, author, producer and composer, he has consistently earned the respect of his peers in the industry. He is also a prolific songwriter, composer and producer. He has written over a dozen songs with legendary lyricist Bernie Taupin (of Elton John fame), produced close to a hundred CDs, and composes music for dozens of TV networks.